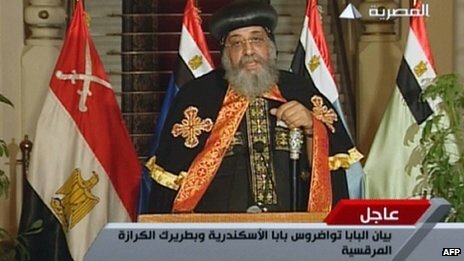 A bishop in Egypt’s Coptic Church says Pope Tawadros II has cancelled weekly public meetings due to concerns over possible attacks on his congregation. Several human rights groups have criticised Egypt’s authorities for failing to protect Christians. Two weeks ago Bishop Angaelos told the BBC that he didn’t mind what kind of government led Egypt – even an Islamist one – as long as individual rights were respected and the country was able to flourish. Now the bishop has revealed that the Church’s leader, Pope Tawadros II, has cancelled some public events at St Mark’s Cathedral in Cairo because of the worsening security situation. Egypt’s Christians have long been a target for disaffected Islamists, many of whom now openly accuse the Church of playing a role in the recent removal of President Mohammed Morsi. When the chief of the army, General Abdul Fattah al-Sisi went on television to announce that President Morsi had been removed from power, Pope Tawadros and Ahmed Al-Tayeb, the Grand Sheikh of Al-Azhar, Cairo’s ancient seat of Muslim learning, both made statements. Pope Tawadros said that the “roadmap” mentioned by the general had been devised by honourable people, who had Egypt’s best interests at heart. Some Islamists took this as a sign that the Church had conspired in their leader’s overthrow. The events that Pope Tawadros has cancelled are thought to be Bible lectures, where he takes questions from the congregation gathered inside St Mark’s Cathedral. On Wednesday, 16 Egyptian human rights organisations denounced the government’s failure to protect Copts, and said Muslim Brotherhood leaders were using hate speech to make political gains.